CHILD BENEFIT IS vulnerable to cuts in the Budget as it is not a “basic social welfare rate”, a Government minister has insisted. Fears are mounting that the welfare payment could be hit by a blanket cut of €10 a month, after reports yesterday suggested the measure was on the table for the upcoming Budget. Independent senator Jillian van Turnhout, of the Children’s Rights Alliance, has warned that such a measure “will push more families into poverty”. Yesterday Jan O’Sullivan, Labour Minister of State for trade and development, appeared to admit that the cut could be on the way. 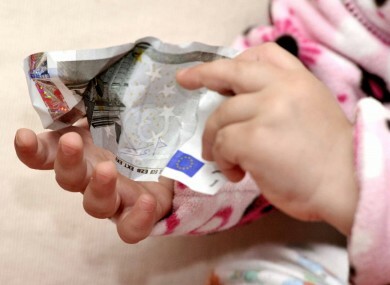 Jillian van Turnhout told TheJournal.ie that an across-the-board cut in child benefit would be a “blunt instrument” which would affect families nationwide. “Already Barnardos are telling us that children are going hungry, and we’re hearing this from schools around the country also,” she said. The senator added that it would be the third time child benefit had been cut in successive Budgets. She suggested that if there was a problem with those on higher incomes receiving child benefit, then it should be taxed back to the Exchequer as part of their income tax calculation. TheJournal.ie revealed on Friday how leaked draft financial documents show the Government will heavily target social welfare to achieve Budget savings. According to the Irish Independent, a cut of €8 a week in unemployment benefit is also being considered by the Government. However, sources told the newspaper that Minister for Social Protection Joan Burton was resisting the measure. Email “Fears mount over Budget cut to child benefit”. Feedback on “Fears mount over Budget cut to child benefit”.